A young man with no recent travel was diagnosed with acute myeloid leukemia (AML). He underwent allogeneic hematopoietic stem cell transplantation (allo-HSCT) with posaconazole and levifloxacin prophylaxis after completing standard induction and consolidation chemotherapy, complicated by culture-negative febrile neutropenia. Just after engraftment, he developed fever again (absolute neutrophil count of 370 cells/cubic millimetre of blood). Septic work up was negative, and empirical piperacillin/tazobactam for 5 days did not help. A CT thorax was done, showing a solid nodule (figure). He had remained on oral posaconazole throughout the period. 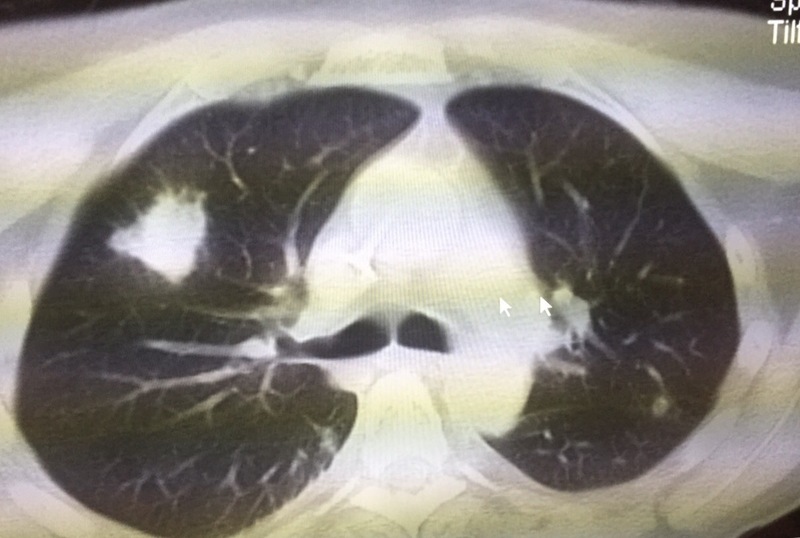 CT thorax showing right lung nodule (ignore arrows). Serum galactomannan was negative, and bronchoscopy with bronchoalveolar lavage and transbronchial lung biopsy (under platelet cover) was performed. Serum posaconazole levels were optimal. Question: What are the likely differentials for the fever and lung nodule? The most likely differential diagnosis would still be invasive fungal disease despite adequate levels of posaconazole. Breakthrough fungal infections in such patients continue to occur, albeit reduced by between 50% to 75% compared to patients who are on either fluconazole or posaconazole prophylaxis in both clinical trials and post-licensing studies of the latter antifungal agent. However, because invasive fungal diseases are far more uncommon with posaconazole, it is worthwhile performing more extensive and invasive investigations prior to subjecting the patients with pulmonary nodules to broad-spectrum (and expensive) antifungal therapy. A biopsy of such lesions is ideal but occasionally difficult to accomplish because of thrombocytopenia or lack of skilled, experienced radiologists or pulmonologists. In this particular case, the histological diagnosis was bronchiolitis obliterans with organizing pneumonia.